Faced Hitters Who Could ! Pitchers possessing the gifted art of pitching even when achieving the top accolades and becoming the master of throwing the baseball with precision and gusto still requires a mindset to out duel those which might have his number as a hitter . Throughout the league be it the National League or the American League and now the interplay between leagues even though he might acclaim Hall Of Fame credentials will have to face hitters which for some mythical reason are truly trouble for his mastery as a pitcher. 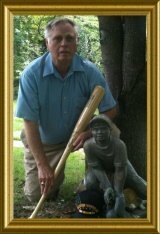 My Linked In friend Mike Lynch the Man at the helm over at Seamheads and his indepth portrayal of many wonderful facts and human interest stories about our game of baseball is super. Bert Blyleven: 287 wins; 3,701 strikeouts; 3.31 ERA; HOF inducted 2011- It took until his final year on the ballot, but Blyleven was finally inducted into the Hall of Fame this year after a worthy career. He often pitched for losing teams, but was one of the most consistent in baseball for the better part of 20 years. Blyleven had an interesting stat line against Oddibe McDowell. McDowell was a .253 career hitter, with 74 home runs over seven Major League seasons. It seemed that the matchup he had with Blyleven was always feast for one and famine for the other, but seesawed back and forth in terms of who had the upper hand. McDowell went 12 for 32 with 5 walks and five home runs against Blyleven. But on the other hand, Blyleven struck him out 12 times. Bob Gibson: 251 wins; 3,117 strikeouts; 2.91 ERA; HOF 1981- Gibson was as intimidating a speed ball chunker as the game has ever seen. He is well known for buzzing hitters whenever he felt they were too close to the plate, and for being so tough that he once pitched a World Series game on a broken leg. None of that seemed to matter to Tim Foli, a sixteen year Major League veteran infielder. Foli hit a punchless .250 in his career, with just 20 home runs in 6,047 career at bats. Foli did not seem to be intimidated by Gibson, because he had 14 hits in 29 at bats, with 2 home runs. He also produced a double and a triple, and only struck out 3 times against the great St. Louis right hander. Sandy Koufax: 165 wins; 2,396 strikeouts; 2.76 ERA; HOF 1972- For as great as he was, it is downright scary to think of what Koufax’s final numbers would have been if an arthritic arm hadn’t forced him to retire at age 31. With his blazing fastball and devastating curve, Koufax mowed through National League hitters during his prime, with one exception being catcher Hal Smith. Smith played in the Majors for seven seasons, hitting .258 with 23 home runs in 1,997 career at bats. He saved his best efforts for when he faced Koufax. In 33 official at bats against him, Smith got 12 hits, including 4 doubles, a triple, and a home run. He even drew 3 walks for good measure, and only struck out 4 times. Nolan Ryan: 324 wins; 5,714 strikeouts; 3.19 ERA; HOF 1999- The “Ryan Express” got a lot of hitters out during his career, particularly by way of the strikeout, but Andres Thomas was not usually one of them. Thomas, a career .234 career hitter for the hapless Atlanta Braves of the 1980’s. Thomas had a paltry .255 OPB for his career, but went 6 for 15 against Ryan, with 2 home runs and just 1 strikeout. Tom Seaver: 311 wins; 3,640 strikeouts; 2.86 ERA; HOF 1992- No matter how great Seaver pitched, one of the lightest hitters in the National League during the 1960’s seemed to have his number. Infielder Woody Woodward played nine seasons in the Majors, hitting .236, with 1 home run in 2,187 career at bats. His career .294 OPB and .287 slugging percentage are indicative that his value came from his glove and not his bat. That is, except when he faced Seaver. In 31 career at bats against Seaver, Woodward banged out 12 hits, including 2 doubles, while only striking out once. Don Sutton: 324 wins; 3,574 strikeouts; 3.26 ERA; HOF 1998- The highest batting average that Gary Sutherland mustered in a full season was .258, and was typically well below that. During his 13 year career he hit .243 with 24 home runs, and had a slugging percentage of just .308. Sutherland likely wished he could have hit against Sutton every game, given his 11 for 27 with 5 doubles. The lack of success that these Hall of Fame twirlers had against some less productive hitters proves that everyone in the Major Leagues is talented on some level. It also shows that at times players can just read some deliveries better than others for whatever reason. Fortunately for these all time greats, they got to face many other hitters too, because if they had not mastered the art of pitching, they may not have gone on to become legends as Pitchers Are Boys On The Mound being enshrined in Cooperstown. Becoming a real to goodness great baseball player throwing heat,smoke and fancy cutters from the hill game after game and pitch after pitch requires the toil and sweat of how to pitch and also the how to play baseball. Go Shopping With Baseballfarming Friends and Merchants.